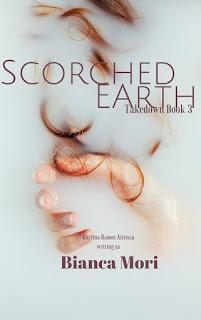 Bianca Mori: Scorched Earth launches; plus: a playlist! Scorched Earth launches; plus: a playlist! It’s funny to think that this whole thing started out with a simple prompt to write a steamy romance set in a beach. Little did I know it would snowball into this crazy story with trips to a fictitious Pacific Island and all around Europe, assumed identities, art heists, double-crosses and even a love triangle. Getting to ‘The end’ wasn’t easy. Fleshing out the outline felt less like beefing up a skeleton and more of trying to write myself out of a hedge maze. Read the rest of the piece over at Will Read For Feels! Scorched Earth' looks like an excelent read. The cover is just so beautiful. It draws you right in. Where can I get a copy of this book?